Currently teaching Land Surveying for the Apprenticeship Program with N.C.S.J.A.C. B.S. Degree Agricultural Business Management California State University, San Luis Obispo, March 1985. 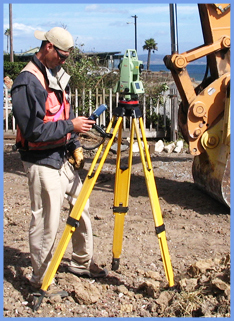 President – Monterey Bay Chapter, California Land Surveying Association and Director to the State Board. Principal/Surveyor with Mid Coast Engineers, Inc. In charge of surveying projects and activities, consultant for land use, planning and subdivision. Computer project design and drafting, research, crew supervision, and client/government agency liaison. Principal/Associate Land Surveyor/Party Chief with Mid Coast Engineers, Inc.
Project Management, field and office for boundary surveys, subdivision layout, control surveys, construction staking and topographical surveys. Computing, drafting, research, liaison with clients and governing agencies. Party Chief with Mid Coast Engineers, Inc.
Field: Boundary surveys, photogrammetric control surveys, GPS control surveys, topographic surveying, subdivision layout and construction staking. Office: Computing, drafting, research, liaison with clients and governing agencies. In charge of surveying projects and activities, consultant for land use, planning and subdivision. Computer project design and drafting, research, supervision, liaison. Associate Land Surveyor with Mid Coast Engineers, Inc.
Project management, field and office for boundary surveys, subdivision layout and construction staking. Computing, drafting, research, supervision of technicians, liaison with clients and governing agencies. Field: Boundary Surveys, photogrammetric control surveys, topographic surveying. Subdivision layout and construction staking. Office: Computing, drafting, research, supervision of technicians, liaison with clients and governing agencies. Courses in GPS, Subdivision Map Act, Computer Drafting (AutoCAD), ALTA Surveys.